In what some are calling one of the most significant threats to democracy that Cambodia has faced in a generation, the CPP-controlled National Assembly on Monday voted to give the government and courts sweeping new powers over political parties. Unhindered by an opposition that chose to boycott the vote, CPP lawmakers, pausing only to correct a few spelling errors, rammed through amendments to a 20-year-old law, giving its government the facility to suspend and dissolve its political rivals over vaguely worded offenses. 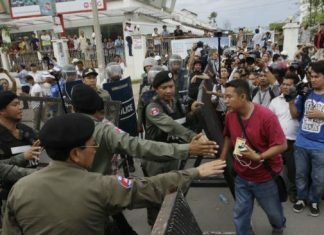 Prime Minister Hun Sen, who has ruled the country for more than three decades, has made clear that the changes are aimed at the CNRP, which nearly defeated his party in national elections four years ago and continues to pose the greatest threat to the CPP’s power since it first won democratic elections in 1998. 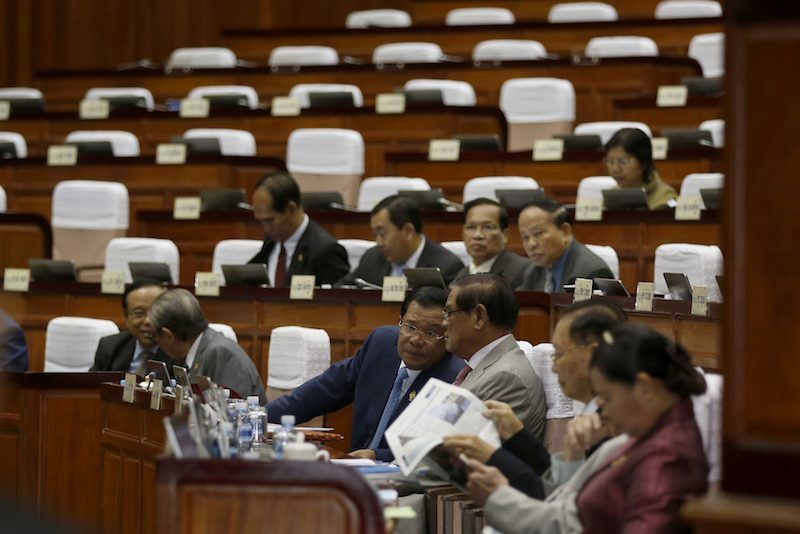 “Once it comes into effect, the Interior Ministry will have full ability to implement it and sweep out any political parties that do not fulfill their functions and duties as political parties,” CPP lawmaker Chheang Vun said on Monday on the parliament floor after the vote. The CPP claims Cambodia needs the amendments to keep the country from falling apart at the hands of irresponsible parties. The CNRP says the amendments are the real threat, giving the ruling party unconstitutional new powers to do away with its rivals at will and rob voters of the representatives of their choice. Lacking the Assembly seats to block the changes, the opposition party stayed away from the vote to avoid lending it any legitimacy. Phil Robertson, deputy Asia director for Human Rights Watch, said the amendments extinguished any hope of the free and fair multiparty democracy promised by the 1991 Paris Peace Accords, which helped drag Cambodia out of decades of war. He said they were the culmination of Mr. Hun Sen’s efforts to consolidate absolute power, tipping the country distinctly toward one-party states like Vietnam. Mr. Robertson criticized the democratic governments and aid donors helping prop up the country with their money for staying largely quiet since the prime minister proposed the amendments more than three weeks ago. The U.S. Embassy issued its first unsolicited remarks on the amendments only on Monday, after they were passed. It called on the government to ensure that all parties have the chance to compete as equals in June’s local elections and the all-important national vote next year. “Any government action to ban or restrict parties under the new amendments would constitute a significant setback for Cambodia’s political development and would seriously call into question the legitimacy of the upcoming elections,” it said. The government has dismissed all criticism of the amendments. The amendments were sent to the rubber-stamp Senate on Monday afternoon and will head to the Constitutional Council after perfunctory reviews and a vote. The Interior Ministry will also be able to suspend a party for the same reasons indefinitely. Sam Rainsy, the longtime figurehead of Cambodia’s democracy movement, resigned as CNRP president just over a week ago in hopes of saving his party—he lives in exile in Paris facing a two-year prison sentence for a defamation conviction widely seen as politically motivated. The amendments require a party that loses its president to refill the post within 90 days. After Monday’s vote, CPP spokesman Sok Eysan said the 90 days for the CNRP would start as soon as the king signs the bill, which he expected to happen soon. The CNRP named its vice president under Mr. Rainsy, Kem Sokha, as acting president since the resignation on February 11 and plans to hold a party congress in April next year to pick a permanent president. Mr. Sokha, who merged his opposition party with Mr. Rainsy’s in 2012 to form the CNRP, is likely to take the top job, although he remains under investigation in a corruption case, also widely seen as being politically motivated, involving an alleged mistress. If the CNRP indeed has to find a permanent new president within 90 days of the king’s signature, it could force a legally vulnerable Mr. Sokha into the post as soon as May, just ahead of commune elections on June 4.